AKIPRESS.COM - Ulaanbaatar city Tourism Department, Ulaanbaatar Tourism Association and Mongolian Eagle Hunter's Association will jointly organize the Spring Eagle Festival on March 4-5 at ‘Chinggisiin Khuree’ tour camp, Montsame said. The event, which started being organized in 2000, aims at reviving eagle hunting customs and traditions of Kazakh people, inheriting the culture of hunting with eagle into young generation, publicizing this tradition to tourists and making it a tourism product. Traditionally, the festival is organized as a competition. Participants of a competition wear their traditional clothes, sit their trained eagle on their arms and enter the festival field riding horses. The festival participants will compete for awards of Best Turned Out Eagle and Owner, Best Eagle at Hunting Prey and Best Eagle at locating its owner from a distance, dressed in full eagle hunting regalia and mounted on groomed decorated horses and Bushkashi-goatskin tug of war on horseback. 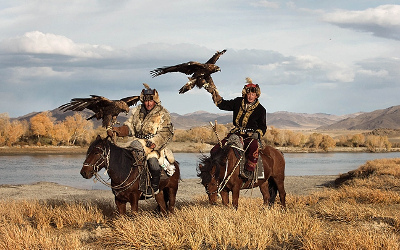 This unique tradition of eagle hunting which came into central Asia 6000 years ago has been one of main product of tourism and the number of foreign and domestic visitors has been increasing year by year and is being held twice a year-spring and autumn season in Mongolia. In 2010, UNESCO inscribed the practice of eagle hunting also known as Falconry to its Representative List of the Intangible Heritage of Humanity.